Indian Defence Secretary Pradeep Kumar (right) and his Pakistani counterpart, Lt. Gen.
New Delhi: India and Pakistan Monday inched forward in their efforts to resolve the 27-year-old dispute over the Siachen Glacier, the world's highest battlefield, with a "constructive" and "cordial" meeting between their defence secretaries after a gap of nearly four years. On the first day of their two-day meeting here, the two sides also presented their "perception" on the Siachen Glacier, which is under India's control since April 1984 when its troops beat the Pakistani army by a day to occupy the icy heights, ranging from 16,000 to 22,000 feet, along the Saltoro Ridge in Jammu and Kashmir. "The defence secretaries of India and Pakistan began their Siachen talks here today. After a one-to-one meeting between them for about 25 minutes in the morning, they held a delegation level meeting. The talks were held in a cordial atmosphere," a defence ministry official said. "The entire approach to the issue at hand on both sides was constructive and the discussions were held in a positive frame of mind. Both sides presented their perception on the Siachen issue. They touched upon other pending issues too," the official added. Since the ceasefire between the two sides began in November 2003, Pakistan has wanted India to demilitarise the glacial heights, but New Delhi has asked Islamabad to first authenticate the 110-km Actual Ground Position Line (AGPL) before any talks on withdrawing troops from the glacier can begin. 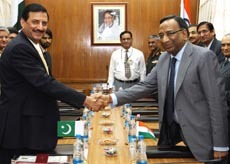 The meeting between Indian Defence Secretary Pradeep Kumar and his Pakistani counterpart, Lt. Gen. (retd.) Syed Athar Ali, is the 12th round of talks on Siachen. The talks are part of the two nations' larger effort to resolve outstanding issues between them. 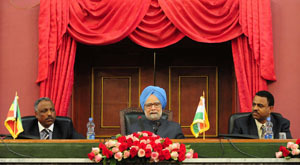 The two countries had decided to resume their dialogue, which was put on hold after the November 2008 Mumbai terror attack, following meetings between their prime ministers in Thimpu in April 2010. The foreign secretaries and home secretaries of the two countries have already met and now it is the turn of the defence secretaries. The Indian delegation for the talks included Special Secretary R.K. Mathur, Director General Military Operations Lt. Gen. A.M. Verma and the Surveyor General, S. Subba Rao. The other members of the Pakistani delegation are Maj. Gen. Ashfaq Nadeem Ahmed, Maj. Gen. Munwar Ahmed Solehri and Maj.Gen. (retired) Mir Haider Ali Khan. The discussions will continue on Tuesday and at their conclusion, both sides are expected to issue a joint statement detailing the forward movement achieved in the talks. The Siachen dialogue began in 1985 after an initial discussion between then Indian prime minister Rajiv Gandhi and then Pakistani president Gen. Zia-ul-Haq in Oman and New Delhi. From the eighth round of defence secretary-level talks in August 2004 in New Delhi, it became part of the composite dialogue between the two countries on all pending issues, including Kashmir. Explaining the historical aspect of the Siachen dispute, the defence ministry official said the Line of Control (LOC) in Jammu and Kashmir was delineated by the Shimla agreement of 1972 up to point NJ-9842 on the glacier. "The area beyond this point has remained un-delineated. This has led to different interpretations," he added. Pakistan claims that the LOC joins NJ-9842 with the Karakoram Pass to its northwest. The Indian position is that the LOC runs along the watersheds formed by the Saltoro Range, as per the internationally-accepted principle of border delineation.